So, you are ready to start building your HTML5 website or web app, but where do you start? If you have been doing this for a while, you are probably a little tired of rewriting the same HTML structure tags and created some sort of a template. If you are not already using some preset HTML5 blank templates, this article will walk through the HTML5 structure from scratch to finish and explain how everything fits together with demos and examples. This is a very basic introduction to building the web with HTML5. doctype - a doctype stands for document type declaration and it provides a DTD (document type definition) which defines the version of HTML being used in the page. This tells the browser how to parse and understand HTML tags and for HTML5, the doctype is just html as in <!DOCTYPE html>. html - this tag is the root element of the HTML5 web page and it permits one head and one body element. head - this element includes metadata about the page using elements like the title tag, meta tags like description or favicon, stylesheets, and scripts. body - this element has all the content of the HTML page. header - HTML5 tag used to group introductory or navigational aids, generally at the top of the page or section. footer - similar to the HTML5 header tag a footer is often used at the bottom of the page or section. section - a generic section of the document that groups some content. Metadata like charset encoding could be specified through HTTP headers instead, but either way, it is a best practice to tell the browser how to encode the characters in the HTML document. If it is added to the document it should be placed as the first element inside the head tag. 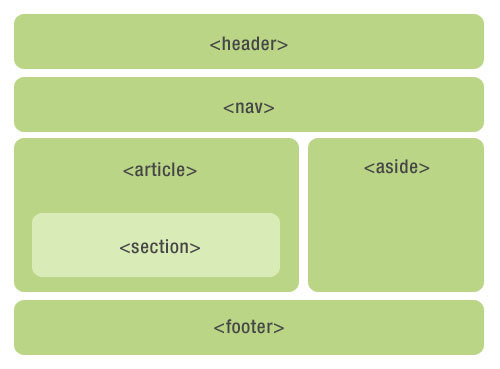 aside - HTML5 element used for a section that is related to the content around it like a sidebar. article - HTML5 element for some self-contained content which could be an actual article, or a blog/forum post, a user comment, etc. Notice that I have reused the header and footer tags inside the section element. This is totally valid and it makes sense as these HTML5 semantic tags are now related to the specific section and not the entire page. They could be placed inside the article tag as well and then they would relate to the article. The body now has the navigation outside of the header with two items inside of a ul element which is used for an unordered list of items. The main section now includes two articles and the aside element is within the main section, providing content that is relative to the articles in the section. The aside also splits the upcoming links and images in its own section tags. The repetition of h1 heading tags inside the article (in addition to the one used for logo in the header) makes sense and it does not have a negative impact on search engine rankings. In terms of SEO, I have also added teh meta description tag, as it is still useful for search engines, unlike the meta keywords tag. The viewport meta tag optimizes rendering on mobile devices and our values there specify the device to match layout width to the device width and set the initial zoom to 1:1 scale. You can read more about the viewport tag here. Normalize.css is a small external stylesheet that brings consistency in cross-browser rendering. As a result, your code looks the same in different browsers and you can read more about normalize.css here. The last piece added to the head element is a special embedded font that we want to use on our page. Google Fonts makes this pretty easy and they have a decent selection of fonts. Notice how the Lato font is used in the style tag.